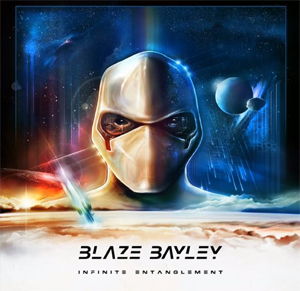 Former IRON MAIDEN frontman Blaze Bayley has released a new music video for the track “Human”, which will appear on his upcoming eighth solo album, Infinite Entanglement, scheduled for release on March 18th. Check out the video on KNAC.COM now right HERE. Blaze previously had this to say on the new album: “I've always had a strong interest in science and cosmology and A.I. and those subjects have featured in a lot of my songs on past albums. Now I’m taking this to the next level by having a complete concept album set 100 years into the future. This is a story that follows on from the ideas and songs I had on my first two solo albums, Silicon Messiah and Tenth Dimension. I'm really excited about being able to have some of my fans involved so much at this stage of the process. There are always struggles, great moments, little bits of magic and some kind of crisis that happens during the process of making every one of my albums so far. I’m sure this one will be no different. I can’t wait to share these moments with the fans. I want to say a massive thank you to all my fans. Your support has made it possible for me to be independent and to continue making music. Now I will attempt make the best record I have ever made."